This small, compact group of three elongated islands, stretching 1500km down the southern latitudes of the Pacific Ocean, is home to just over 4 million people. These laid-back, friendly folk give a warm welcome to visitors as they travel the North Island, South Island and Stewart Island. Tourist facilities are world-class, offering a wide range of accommodation and touring options and there is a network of 100 Visitor Information Centres to help you along the way. In many ways New Zealand is a microcosm of the world’s visitor attractions. This compact country, similar in size to Britain, Japan or Colorado, has a spellbinding landscape of emerald-green pastures, crystal-clear rivers, primeval rainforests, shimmering lakes, thermal wonderlands, towering peaks, grinding glaciers and spectacular fiords. The remarkable thing is that all these diverse features in this truly ‘clean, green and pristine’ country are easily accessed on good roads, within a short driving distance. Within a day’s easy touring you can take in a scenic flight over the Southern Alps, soak in a thermal spa, jet-boat through white water rapids, bungy jump off a bridge, whale watch, and still have time for a leisurely Kiwi-style meal of crayfish (lobster), succulent mussels and first-class wine. 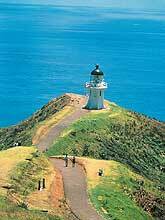 Fresh air, magnificent scenery, outdoor activities, fine food and wine are things that New Zealand has in abundance. Getting around the country is relatively simple. Cycling, hitching and driving hire cars or campervans are all popular and there are many all-inclusive conducted coach tours on offer. Finding accommodation is easy and it’s only during the high season (December-February) that you need to book well in advance. New Zealand's main scenic highlights can be seen on an intensive two week itinerary but really you need at least four to six weeks to gain the most benefit out of your visit downunder. 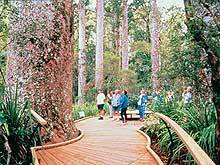 This allows time to explore some of the fascinating wilderness areas, including the unspoilt native forests and dramatic alpine and coastal areas. A surprising one third of the total land area is conservation estate, protected by the Department of Conservation. 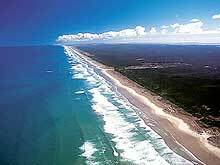 Access for bushwalking, kayaking, tramping, climbing, hunting and saltwater fishing is absolutely free. Fresh water fishing and hunting require permit applications. Permits, wilderness hut passes, local maps and guides can be obtained for a small charge from Conservation offices. New Zealand’s unique landscape, flora and fauna largely result from geological factors. This narrow landmass broke away from the super-continent of Gondwanaland aeons ago and evolved as a land of birds. Many became flightless due to the complete absence of land mammals, snakes and other predators. In addition, New Zealand sits on the Pacific Rim of Fire volcanic belt, and the relentless grinding of tectonic plates continues to shape our dramatic landscape. New Zealand was the world’s last colonial outpost to be settled by Europeans, so is still making discoveries about its past evolution and forging its national identity as a multi-cultural nation. Given all these factors it is clear the country has a lot to interest and intrigue the inquiring traveller. CLIMATE - This long, insular, mountainous country was named by early Maori ‘Aotearoa' (the land of the long white cloud). It lies in the path of prevailing westerly winds, producing striking contrasts in temperature and rainfall on either side of the main divide of the Southern Alps and the continuous backbone of lofty bush-clad ranges dividing the North Island. The West Coast rainforests are deluged with up to 7 metres of annual rainfall while the Canterbury plains are relatively dry and warm. The differences are less dramatic in the north. The good news for the visitor is that overall New Zealand has a very mild, equable, maritime climate, which is often wet, overcast and unpredictable, but never extreme in lowland areas. The alpine regions are a different story and temperature variations and weather changes should be monitored closely by trampers and climbers. While travelling around the country you will encounter the whole range of weather conditions. The best approach is to carry several layers of light clothing that can be added or taken off as required, including a light rainproof jacket. The seasons here are exactly opposite to those in the Northern Hemisphere. Spring (September-November) is a great time to visit as the country is alive with spring blossoms and frolicking lambs. Summer (December-February) is excellent provided that you have pre-booked accommodation. Temperatures are around 20°-30° Celsius and Kiwis head to the beach and the bush. Autumn (March-May) is good too as the weather is still pleasantly warm and poplar trees in the South Island are a brilliant golden hue. Winter (June-August) is also great as the ski slopes are humming and you can travel around easily. It is still mild in the north and relatively dry in the south and east. CURRENCY - New Zealand’s unit of currency is the New Zealand dollar (NZ$). Bank note denominations are 5, 10, 20, 50 and 100 dollars and coins are 5, 10, 20, 50 cents as well as $1 and $2. Currency can be exchanged at foreign exchange kiosks and banks at international airports and banking outlets. Traveller’s cheques are accepted at hotels, banks and many stores. All major credit cards can be used in New Zealand. All goods and services in New Zealand are subject to 12.5% Goods and Services tax, which is normally included in the displayed price.